Dixons Retail plc was one of the largest consumer electronics retailers in Europe. 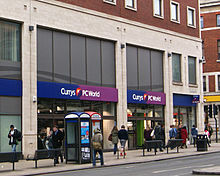 In the United Kingdom, the company operated Currys, Currys Digital, PC World (with stores increasingly dual branded 'Currys PC World'), Dixons Travel and its service brand Knowhow. Dixons Retail's Nordic and central European business was operated under the Elkjøp umbrella, and it also operated Kotsovolos in Greece. The company was listed on the London Stock Exchange and was a constituent of the FTSE 250 Index until its merger with Carphone Warehouse on 7 August 2014 to create Dixons Carphone. At the time of its merger in 2014, Dixons Retail had 530 outlets in the United Kingdom and Ireland, and 322 in Northern Europe. The company, formerly known as Dixons Group plc and later DSG International plc, specialised in selling mass market technology consumer electronics products, audio video equipment, PCs, small and large domestic appliances, photographic equipment, communication products and related financial and after sales services (e.g. extended service agreements, set up and installation and repairs). It also sold other products and services, electrical products, spares, mobile services and extended warranties. Dixons was founded as a photographic studio by Charles Kalms and Michael Mindel in the High Street in Southend under the name of Dixons Studios Limited, a company registered in October 1937 with share capital of £100. The name Dixons, selected randomly from the telephone directory, was sufficiently short to fit above the small shop front. During the beginning of the 1940s, Dixons set up seven studios around London but by the end of the Second World War the business was reduced to a single studio in Edgware. Stanley Kalms, the son of the founder, joined the business in 1948 and started advertising the company's products in the press. In 1950, the company started selling cameras, and in 1957, opened a new head office and buying centre in Edgware to accommodate the staff dealing with 60,000 mail order customers and to provide administrative back up for its six stores. Dixons was first listed on the London Stock Exchange in 1962, changing its name at that time to Dixons Photographic Limited. It bought out competitors, Ascotts, in 1962 and Bennetts, in 1964. In 1967, Dixons bought an 85,000 sq ft (7,900 m2) colour film processing laboratory in Stevenage. Charles Kalms was succeeded by his son Stanley in 1971. In 1972, Dixons bought another competitor, Wallace Heaton, and in 1974, it opened its Stevenage distribution centre. In February 1993, Dixons bought Vision Technology Group (VTG), operating under the PC World brand at Croydon, Lakeside Shopping Centre, Brentford and Staples Corner. Later that year, the company sold VTG's mail order division, Dixons US Holdings Inc and Supasnaps. The company opened its first duty free store at Heathrow Terminal 3 in 1994, and later that year launched phone store The Link, the company's first venture into communications. The company's head office was relocated to Hemel Hempstead. In November 1996, Dixons bought DN Computer Services, a computer reseller business. It also acquired the retail assets of Harry Moore Ltd, an Irish electrical retailer. Cellnet bought a 40% stake in The Link in April 1997. Also that year, the Dixons website was launched. In 1998, Freeserve, a free Internet service, was launched; it was later sold to France Telecom and renamed Wanadoo. Dixons bought Elkjøp ASA, a Norwegian retailer, in November 1999. In October 2002, Dixons bought UniEuro, an Italian-based electrical retailer, and Genesis Communications, a mobile phone service provider. The company opened its first Electro World store in Hungary in February 2002. In October 2005, Dixons Group plc changed its name to DSG International plc. Further potential expansion came in April 2005, when DSGi bought an interest in Eldorado Group, the largest electrical retailer in Russia and Ukraine, with an option to buy the rest by 2011 at a fixed price of US$1.9 billion (£1 billion GBP). This option was not pursued, DSGi withdrawing their interest in April 2007. In May 2006, DSGi was awarded the Queen's Award for Enterprise. The company announced that the Dixons brand would continue purely online and that all high street stores would be rebranded Currys.digital. DSGi also bought 75% of Fotovista, a French photographic business. In January 2008, DSGi announced that it would stop selling analogue televisions and only sell integrated digital televisions, in an effort to get consumers ready for the digital switchover. In May 2008, DSGi announced that it would close 77 of its 177 Currys.digital shops in the United Kingdom, as their building leases expired over the following five years. In May 2010, the company secured almost exclusive rights to sell the Apple iPad. In June 2010, DSGi changed its name to Dixons Retail plc. In May 2014, Dixons confirmed a proposed merger with Carphone Warehouse which would lead to a market capitalisation of around £3.7 billion. Currys / PC World – specialises in home electronics and household appliances. Team KnowHow – a provider of after-sales product support and cover. Dixons Travel – a retailer operating in the main airports in the United Kingdom and Dublin International Airport in the Republic of Ireland. DSGi Business – a specialist provider of IT solutions to business and the public sector. Elgiganten – ("Electrical Giant") sells home electronics and household appliances in Denmark and Sweden. Elkjøp – ("Electrical Buy") sells home electronics and household appliances in Norway. Elko – sells home electronics and appliances in Iceland. Gigantti – ("Giant") sells home electronics and household appliances in Finland. Electro World – electrical superstores in the Czech Republic and Slovakia. The Polish Electro World chain is no longer owned by Dixons. Κωτσόβολος ("Kotsovolos") – sells home electronics in Greece. Since the Prinz brand was introduced in the 1950s, Dixons Retail has used a number of own brand names for products sold in its stores. Logik – Introduced in 2001 and intended for everyday use with an "emphasis on reliability and efficiency" and "a better value alternative to the major name brands without compromising on performance." Advent – Established brand used for computers, peripherals and other accessories. Sandstrøm – Intended to compete with higher end consumer electronics brands, Sandstrøm is claimed to be "Inspired by Scandinavian design [and] designed to combine aesthetics with performance." Goji – Producer of equipment including computers, smartphones and audio products as well as bags and storage. Distributed by Dixons Group. Prinz/Prinzsound/Prinztronic – The Prinz brand was first used on Japanese manufactured goods during Dixons' 1950s expansion. Miranda – Originally the name of a Japanese company, Dixons acquired the brand in 1981, and used it on cameras and photographic kit. As of May 2011[update], Dixons still owned rights to the name, but no longer used it and planned to sell it off. Saisho – Introduced in 1982. Dixons announced its intention to sell the brand off in May 2011. Matsui – Introduced in the 1980s by Currys as a brand for its consumer electronics goods assembled in the United Kingdom, using imported components. Products in the Matsui line involved neither Japanese parts nor Japanese labour, but were branded with a Japanese sounding name, a rising sun symbol and the motto Japanese Technology Made Perfect. A Prinzsound SM8, sold in the United States under the Weltron brand. In December 1988, a British government consumer protection agency charged Currys with misleading advertising. Because of its association with Iwane Matsui, a Japanese general responsible for the slaughter of hundreds of thousands of people in the Nanking Massacre in 1937, the Matsui name brought protests from some British veterans of World War II. Currys was ordered by the Oxford court to drop the Japanese Technology Made Perfect motto and fined USD 7,400, but was allowed to keep the Matsui name. Mastercare Commercial Services, a business operating from a call centre offering IT services to IT businesses, which has since been rebranded as Knowhow. Freeserve, an internet service provider, which was purchased by France Télécom and rebranded as Wanadoo in December 2000 (eventually re branded/merged into Orange). The Link, a mobile phone retailer based in the United Kingdom, sold to O2 in June 2006. Freetalk, a VoIP business, whose customers were transferred to Vonage, a VoIP company based in the United States, in August 2006. Pixmania, a French based online retailer, which was acquired by Dixons Retail in April 2006, and sold in September 2013. @Jakarta, a computer games store, which was sold to Gameplay.com in August 2000. ^ a b The above trend profits for 2000 and 2001 were primarily attributable to profits on disposal of Freeserve shares. ^ a b c "DIXONS RETAIL PLC A YEAR OF SIGNIFICANT PROGRESS" (PDF). Dixons Retail PLC. Wayback Machine. 20 June 2013. Archived from the original (PDF) on 17 March 2014. Retrieved 26 September 2016. ^ "UK's Dixons Retail plans merger with Carphone to create high street giant". The Guardian. Retrieved 15 May 2014. ^ Baker, Lucy (30 November 1999). "Dixons moves into Europe with pounds 440m Norwegian buy". The Independent. Wayback Machine. Archived from the original on 22 February 2009. Retrieved 25 October 2017. ^ "News". The Independent. 10 October 2002. Archived from the original on 11 December 2008. Retrieved 26 September 2016. ^ Balázs, Edith (March 2002). "CENTRAL BANK ASSESSES MAJOR ERROR IN CURRENT ACCOUNT DATA". Business Hungary. Archived from the original on 6 October 2007. Retrieved 26 September 2016. ^ "DSG steps up European expansion". BBC. 19 October 2005. Retrieved 26 September 2016. ^ "Dixons looks to Russian Eldorado for growth". The Register. 15 April 2005. Retrieved 26 September 2016. ^ Team Register (13 April 2006). "DSG snaps up Euro photo etailer". The Register. Retrieved 26 September 2016. ^ "Currys stops selling analogue TVs". BBC News. 22 January 2008. Retrieved 26 September 2016. ^ "Currys.digital to close 77 stores". BBC News. 15 May 2008. Retrieved 26 September 2016. ^ Oates, John (25 May 2010). "PC World gets almost-exclusive iPad deal". The Register. Retrieved 26 September 2016. ^ Wilson, Amy (25 June 2010). "DSG, formerly known as Dixons, is now renamed ... Dixons". The Daily Telegraph. Retrieved 26 September 2016. ^ Hopkins, Jonathon (15 May 2014). "New electricals retail giant Carphone Dixons to be created". This is Money. Retrieved 15 May 2014. ^ a b c "Structure". Dixons Retail plc. Archived from the original on 28 December 2011. Retrieved 13 January 2012. ^ "Mix Electronics S.A. wykupuje 100 proc. udziałów w Electro World Polska sp. z.o.o." Interia. 3 September 2009. Retrieved 6 August 2013. ^ a b "Dixons Retail : History: 1950 - 59". Dixons Retail website. Dixons Retail. Archived from the original on 4 November 2013. Retrieved 4 August 2013. [Stanley Kalms] forged vital links with Japanese manufacturers who supplied Dixons directly with products often made to the company's own specification and sold under the brand name of 'Prinz'. ^ a b c d e f Cox, Caleb (4 August 2010). "Dixons aims high, medium and low with own-brand blizzard". The Register. Retrieved 4 August 2013. ^ a b c d e "PC World and Currys feature exclusive new brands this Christmas". Dixons Retail website. Dixons Retail. 27 July 2010. Archived from the original on 4 November 2013. Retrieved 4 August 2013. ^ a b c Oates, John (18 May 2011). "Dixons to flog off old 'brands' Miranda and Saisho". The Register. Retrieved 4 August 2013. ^ "Dixons Retail : History: 1980 - 89". Dixons Retail website. Dixons Retail. Archived from the original on 4 November 2013. Retrieved 4 August 2013. In 1982 Dixons introduced Saisho own-brand products presenting an upmarket high technology image spanning audio, TV and video products. ^ a b Lohr, Steve (3 April 1988). "'Made in Japan' or Not? That Is the Question". The New York Times. Retrieved 28 September 2016. ^ David Cohen (24 May 2003). "Fighting back after my Mastercare nightmare". The Guardian. Retrieved 26 September 2016. ^ "French rival clinches Freeserve deal". BBC News. 6 December 2000. Retrieved 26 September 2016. ^ "O2 to buy The Link chain for £30m". BBC News. 21 June 2006. Retrieved 26 September 2016. ^ "Vonage Buys Customer Base As Freetalk Stops Talking". HighBeam Research. 31 August 2006. Archived from the original on 11 November 2013. Retrieved 26 September 2016. ^ "Dixons Retail to sell loss-making online store Pixmania". BBC. 5 September 2013. Retrieved 4 February 2016. ^ Reece, Damian (13 August 2000). "Dixons sells @Jakarta to Gameplay.com". Telegraph. Retrieved 26 September 2016. ^ "Preliminary Results 2014" (PDF). Dixons. Archived from the original (PDF) on 10 July 2014. Retrieved 26 September 2016. ^ "Preliminary Results 2013" (PDF). Dixons. Archived from the original (PDF) on 9 September 2013. Retrieved 26 September 2016. ^ "Preliminary Results 2012" (PDF). Dixons. Archived from the original (PDF) on 13 April 2014. Retrieved 26 September 2016. ^ "Preliminary Results 2011" (PDF). Dixons. Archived from the original (PDF) on 12 April 2014. Retrieved 26 September 2016. ^ "Preliminary Results 2010" (PDF). Dixons. Archived from the original (PDF) on 11 April 2014. Retrieved 26 September 2016. ^ "Preliminary Results 2009" (PDF). Dixons. Archived from the original (PDF) on 12 April 2014. Retrieved 26 September 2016. ^ "Preliminary Results 2008" (PDF). Dixons. Archived from the original (PDF) on 11 April 2014. Retrieved 26 September 2016. ^ "Preliminary Results 2007" (PDF). Dixons. Archived from the original (PDF) on 12 April 2014. Retrieved 26 September 2016. This page was last edited on 13 March 2019, at 12:35 (UTC).